It’s the Cat’s Meow. But dogs like it, too. Some of the worst scaredy cats in the world love acupuncture, including the ones that are dogs. Even animals that typically don’t like to be touched don’t seem to mind. 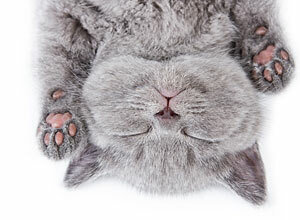 Some are so relaxed during acupuncture sessions that they take real catnaps. It’s good for them, safe and virtually painless. Inserted properly, needles stimulate the body’s natural painkillers and anti-inflammatories. Treatments last from a few minutes to more than 30 minutes, depending on your pet’s needs and condition, and if you want to watch, you can. Acupuncture is used to help cats and dogs with all kinds of disorders, including pain, arthritis, asthma, allergies, and even kidney and liver problems. In many cases, it also helps ease the side effects of cancer treatments. Chinese herbs are often used in conjunction with acupuncture to optimize and lengthen its effects. Herbs are available in capsule, powder and tablet form and are easily digested. To ensure the best product and yield the maximum results, Dr. DuBose prescribes only the highest quality herbs. They contain no animal by-products, endangered plant species or heavy metals, and are subjected to stringent quality control. Don’t expect instant results, but you will see results nonetheless. Depending on the condition, the number of treatments varies. Most musculoskeletal conditions show improvement after four or six sessions. Chronic issues take longer to treat. Unfortunately, not every animal responds to acupuncture. Granted, the numbers are low, but your pet could be among the 8 to 10 percent. Acupuncture has been used on animals for more than 3,500 years. According to legend, veterinary acupuncture was discovered when lame horses used in battle healed better after being hit by arrows at distinct points. In any event, there is evidence that Chinese “horse priests,” the caretakers of the army’s horses, practiced acupuncture during the Zang and Chow Dynasties around 2000 BC. 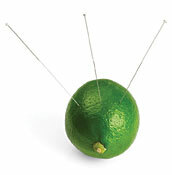 Acupuncture helps relieve pain and speed healing by releasing the body’s natural painkillers and anti-inflammatories. It also sends out neurotransmitters and other cellular mediators that improve circulation and immunity. In traditional Oriental medicine, “Qi” (pronounced chee) runs through channels, called meridians. Think of them as rivers, and when they are blocked a dam forms. Needling opens the floodgates. Scientifically speaking, needling certain points releases chemicals in the muscles, spinal cord and brain to speed healing.